It's been three years without new releases of Nextor, the disk operating system developed by Konamiman on top of the source code of MSX-DOS. But it's never too late for good news, and so here it is: Nextor 2.0.5 beta 1 has just been released. The main change in this version is the addition of a new routine for device drivers: DRV_CONFIG. This allows drivers to specify how many drive letters want to have assigned at boot time and which device should be assigned to each drive by default, overriding the default procedure in which Nextor guesses this information based on the devices available at boot time; this is useful especially for drivers that handle removable devices, since it allows these to have drives assigned even when no medium is present when booting. Implementing this routine is optional, existing drivers will continue to work without modifications. Other than that there are some bug fixes, you can see the full list in the change log directly in the Nextor repository now that Nextor has been published as an open source project. You can download the Nextor kernel ROMs and tools from Konamiman's MSX page, as usual. Fix: if an error occurred while performing sector access and the user selected "retry", the higher byte of sector number was being reset to 0. Thus, when accessing past the first 32MB of the device this caused weird errors, and data corruption when writing. Is this fix related to the hang up that happen randomly when saving files with text editors? Actually I was never able to discover the cause for that hangup issue (and could reproduce it only intermittently), but I think it's not related, because those hangups happened without any disk error being notified. The incorrect sector access bug was notified by Eugeny Brychkov aka Mr. GR8NET. I see. It's hard to catch! Version 2.1 is an alpha and as such it's somewhat buggy. I chose to make these relatively small changes on the 2.0 branch instead so that at least one stable (and up to date) version is available. But of course all of these changes will eventually be implemented in 2.1 as well. OOhhh!! That's great!! Thanks for all!! So cool! Thank you for the awesome work! Amazing! You are a big inspire for all! 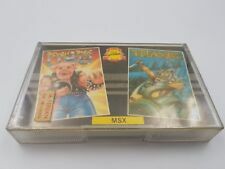 Your work was really needed for the MSX and i like a lot what you did and all the effort it took! I must re-learn as fast as I can how to update MFR and how to build an ASC-8kB banked version in order to flash my ASC-8kB mega ROM because I want to try this version. Let's hope that the 2.1 branch will it receive the DRV_CONFIG feature soon, since it's very useful.